The Calm Water Floating Debris Boom is designed to effectively control trash, litter, debris and even aquatic plants in calm or low flow areas. 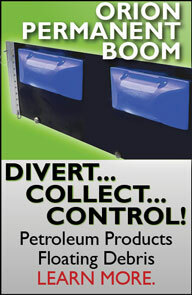 Often deployed as a barrier or containment device, these boom work to keep contaminants to their designated areas. Use of these boom helps to control invasive vegetation, limit the spread of debris, and prevent seaweed from floating into coastal homes or resorts. For extended use in water areas, all boom will feature PVC fabric and marine grade components such as connectors and bottom ballast chains. Skirt Draft: 6" or 12"
Calm water boom are designed specifically for locations with limited water flow and no wave activity. These areas have included marinas, lakes, and ponds. If you are looking to contain debris in areas with moving waters, please feel free to check out our complete Floating Boom Variety. Floating barriers and boom for debris, silt and oil containment are made in numerous designs to accommodate different locations, conditions, and types of debris.